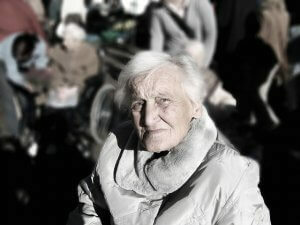 Elder abuse is any form of mistreatment that results in loss or harm to an older person. 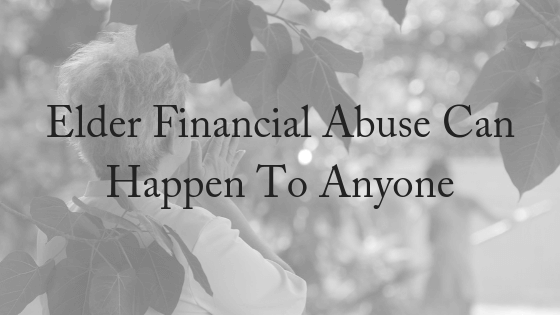 The most common kind of elder abuse is elder financial abuse, where older people are unduly influenced, deceived or exploited out of their assets – and the most common kind of perpetrator is a close family member. But two recent cases from the United States demonstrate that anyone in a position of trust can exploit the vulnerable elderly. With no living relatives and a debilitating diagnosis of dementia, 97-year-old Grace Watanabe needed help with her finances and looked for guidance at Symphony Residences of Lincoln Park, a senior facility where she had been staying since 2010. Watanabe had built up a life savings of $600,000 over a lengthy career as a federal government employee. But instead of helping Watanabe, a group of workers at the home are accused of draining her assets in a year-long scheme that included cashing checks, making ATM withdrawals and transferring money online without her consent, according to the lawsuit filed on her behalf. Virtually all of her life savings are gone. The lawsuit lists a handful of workers at Symphony who are accused of cashing large checks from Watanabe since March 2017. The checks, many of which were described as a gift in the memo, were for amounts up to $50,000. One of the employees, according to the lawsuit, is accused of stealing at least $191,000 and having her two children cash some of the checks. A private contracted caretaker is also accused of cashing two checks, totaling $50,000, in August and September last year. Two of the workers maintained that Watanabe had gifted them the money when she was lucid. Another worker said Watanabe was never diagnosed with dementia. But a doctor contracted by the public guardian found Watanabe had severely impaired memory and cognitive skills. Watanabe has been “totally incapable of making financial and legal decisions” since at least 2016, the doctor concluded. She never married and has no children, the lawsuit said. A brother, described as her only relative, died in 2009. In Watanabe’s case, Bank of America contacted the department twice about its concerns starting in 2017. Most recently, in May, the bank noticed suspicious activity, “including large ATM withdrawals and large check withdrawals by numerous individuals,” according to documents filed in court. The lawsuit asks Symphony to turn over all its documents regarding Watanabe’s finances and the alleged theft. If a judge ultimately rules in Watanabe’s favor, the staff members could be forced to repay the money to her. While most banking employees are trained to recognise and prevent elder financial abuse from occurring, they can also occupy a position of trust among their customers. A longtime employee of Chase Bank was sentenced to three years and eight months in prison for stealing hundreds of thousands of dollars from elderly customers. Leona Parsons worked as a private banker at the Chase Bank while she systematically stole incremental amounts of money from four elder victims. Parsons would help her victims fill out deposit slips, inflating the withdrawal amount and keeping the difference. In over 85 transactions, Parsons stole $300,000 from her victims’ life savings. “There was a grooming period and a trust that was built over many years,” explained Elder Abuse Prosecutor Scott Pirrello. Pirrello said Parsons would go to great lengths to build a trust with the victims – running errands, visiting a sick spouse in the hospital or even attending their friends’ funerals. “She called me every night on her way home,” said victim Leroy Edwards. As a result of the grooming, the clients believed they could trust Parsons. Investigators were tipped off about Parsons after an adult daughter was looking at the bank statement of her 90-year-old father and found a $9,000 withdrawal. She was convicted of six counts of theft from an elder, forgery and identity theft. A total of $56.7 million in property and savings was misappropriated from 139 financial abuse victims in Queensland in the 2013-14 financial year, the Royal Commission into Family Violence heard. Yet it is a vastly under reported issue, and the financial loss is likely to be much higher. It’s also expected to increase as Australia’s population ages. What if I suspect elder financial abuse is happening? Seek legal advice immediately. The sooner you seek help the easier it is to remedy the situation. Once assets are sold or spent, it is unlikely that they can be restored. If you suspect that a loved one is experiencing financial abuse, please contact us for a free, 10-minute phone consultation.